So, I’m a bit new to the blogging scene. It’s a little intimidating, to be honest, and if we were at a real party, I’d probably be hanging out by the buffet or helping out in the kitchen, trying to distract myself from a bad case of nerves by eating chocolate cupcakes or offering to wash the dishes. But, this is a virtual party, and while virtual cupcakes have no calories, they also have no taste. (Up side — did I mention no calories? And no dirty dishes.) I still have something real to celebrate, though — a brand spanking new website coming in four weeks, followed by my debut novel Evenfall in February. 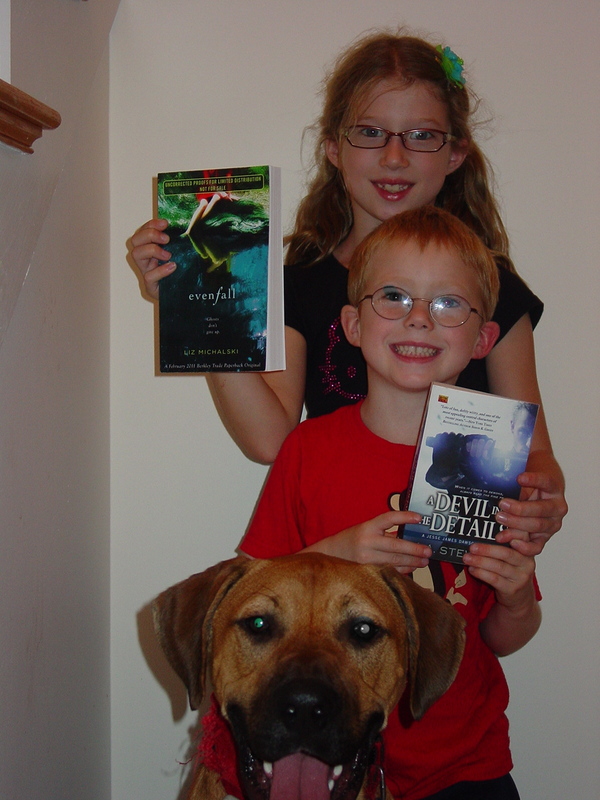 Small children and dog not included in prize package unless it has been a particularly trying day. This week’s question — what’s your favorite website or blog? My favorites are over on the right, under the heading “People I Read Who Don’t Post Enough. *” Check them out, let me know what you think, and let me know what your favorite sites are — which ones do you visit every day? *These blogs do not reflect the opinions of the management. Except, damn it, they do. Well, hello. It still said password protected, but I found the comment box this time, LOL. Anyway, welcome to the blogosphere! I hope you come to enjoy your blog as much as I have mine. (And thank you for putting my in your blogroll. I’m honored.) I’m looking forward to getting my grubby hands on your book, whether it comes with or without children and pup. *On principle; nothing specific at the mo, though I’m sure that will change after she reads this reply. Thanks so much Jan for all your help. You are awesome! Congratulations on your debut. It’s a great start. I wish I had more time to read blogs! The only blog I check in on with any regularity (if you can even call it that) is Tartitude, and occasionally WU, both of which I heartily recommend. I do check in on my friend’s blog once in a while too, sandiegomomma.com, because she really lets it all hang out, she’s very funny and vulnerable, and it’s a wonderful way to keep up to date on her doings. One of these days I will join the blogging world. Perhaps when Jan holds my hand. Ha. Thanks, Deb. I need to let go of Jan’s hand first before you can grab it! 🙂 I’m holding on for dear life! This blog looks good– so good in fact it is now my favorite blog! Honestly, I don’t stray too far from Facebook or my 3 e-mail accounts long enough to read many blogs, so yours, my dear, will be my one and only and favorit-est! AND I am looking forward to your novel’s debut. I feel like I know it so well already wink wink. Do I get a prize? Hee — you are too funny. It’s a RANDOM contest, otherwise you’d definitely win. I’ll post the winner early next week. Personally, my favorite blog is http://www.mom2my6pack.blogspot.com/ Dawn has a fantastic sense of humor and writes mostly about mommyhood. Love the ebay story, love the Adventures in Grocery Shopping. Have fun!! Thanks so much for stopping by, Heather!! Ooohh! Gorgeous book!!!! Congratulations on your blog’s debut. You’re a natural . . .
My husband calls me a Backspace junkie, so I guess that must be my favorite website. Thanks, Julie. Good luck to you….And thanks for the Backspace reminder — I’ll have to add it. Whoops. Thanks for the reminder, Tim! BTW, I ordered your book — I can’t wait to read it! Annnnd there’s one in every crowd…. Favorite blog…uhmmm….do I have one now? I read a lot of stuff but I mostly skip around according to topics that come up in things like my various Twitter feeds and Google alerts. So I’m not sure that I have one at this point. Though when I’m in a bad mood, I like to go to zooborns.com! The cute factor is pretty much off the charts. My daughter love zooborns …thanks for visiting, Lisa! Good luck with everything. We are so very proud. We already have books on order, but as we know, I, Mr. Jeff will be holding out for the cupcakes and a pillow. Book related prizes will not cut it. I believe the next book should be geared more towards “The Old Man and The Sea” or Jeff’s Life. Um, I do not read any blogs regularly, nor do I do Facebook, MySpace, whatever. Too afraid I will run into one of my students out there in cyberspace. I took a look at your fav blogs Liz, and I liked the first one and the last one. Am I still in the running for a prize? I know exactly what you mean, Linda. And yep, you are in the running! Book giveaway is Wednesday! As you already know…..I’ve begun the bragging process telling everyone I know my friend Miss Liz is a famous author! And yes, it’s true, I will stock stacks of your autographed books as gifts! She is an amazing photographer, writer, artist and all around cool cat. My favorite website, again you know me well…….Anthropologie, or anyplace I can virtually shop till I drop! Congrats on this! Very nice!!!! I’m afraid that this is my first blog read, so I don’t have any recommendations. Was I the last person out there not reading these???? Now that I look around they are everywhere. As my kids frequently tell me, I’m still living “back in the day”. Well I promise to follow this one. I can’t wait to see their faces when they realize that I’m not living in some parallel universe. I look forward to a great read in February. Really, I can just picture it, snow falling gently outside, sweatpants, and a mug a hot chocolate in hand. Hmm…I think I’ll be busy in Feb. still trying to beat you at Moxie! This site has saved me more than once for dinner party menus. Good luck with the blog. Thanks, Sandy. I love epicurious and I miss Gourmet magazine. Nothing else can take its place…. I looked at your blog just now and really enjoyed the interview! I just missed going to the Bon Jovi concert mentioned…how funny is that! Couldn’t post bc I don’t have a google account yet, but will definitely keep reading! Ahh not sure I should admit this… but I’m not sure I know what a blog is? I just figured out texting. This is a big step. I really liked your email about hyperventilating. Pretty funny. I can’t wait to read more. Oh yeah, yours is my favorite. Wow, 33 commenters on your first post! And your taste in blogs is impeccable. Also, I think it is fantastic that your novel is being published. Here’s to brisk sales and lots of buzz. You’ve finally done it! The blog looks awesome, and I’ve already bookmarked it as a favorite. My former (ahem..) favorite blog is Soulemama, inspiring me to be the mom I want to be. I’ve already preordered your book, but how about posting some excerpts to whet our appetites and tide us over till February. Congrats! OK, here you go. Hope you’re not looking for depth. Favorites: The Harry Potter Books and anything by David Feherty as there’s genuine genius in his intentional stupidity. I love HP too, and I’m so glad Rowling hasn’t completely ruled out doing more!